You’ve installed your beautiful new stove and its roaring away but do you suspect you may not be basking in the direct heat you had hoped for? This can be a side effect of radiant stoves due to the natural cycle of hot air rising off the stove only to be replaced by cooler air filling its place, creating cold spots in your home. Woolly Mammoth Stove Fans are designed to counter this problem by sitting discreetly atop your stove and evenly circulating the heat on air patterns created by the rotating blades to reduce hot and cold spots in the room. The increased efficiency and reach of heat output will result in less trips to refuel the burner, reduced fuel costs and increased enjoyment. The stove fan is effectively an engine that uses the heat differential between the base of the unit and the top of the fan to drive the motor which in turn, turns the blades. Place your fan on one side at the back edge of the stove. In this position, it will draw cooler air from the back of the stove area. The ideal operating temperature is between 205°c and 345°c. 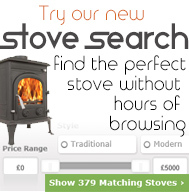 A stove thermometer is also essential for ensuring the temperature does not exceed 345°c. When the stove temperature falls below approx. 85°c the fan will cease to turn. If possible leave a gap of 150mm 6” between the back of the fan and the wall. A heat-powered fan designed to circulate the warm air created by a wood or multifuel stove. Improved warm air circulation results in greater comfort and less fuel consumption. Costs absolutely nothing to run… Using the heat from the stove, it is the most economical way to effectively circulate warm air. No cables, plugs or batteries are required. Stylish black design which blends into décor easily.